The Seaforth Highlanders of Canada Museum & Archives is pleased to announce that our collection of signed kilt aprons is now on display in the Anderson Room of the Seaforth Armoury. Kilt aprons were issued to Highland Battalions during the First World War to protect the men's kilts from the mud and mire of the trenches on the Western Front. Made from cotton canvas, there were two versions of the kilt apron: a practical one that wrapped completely around a soldier's kilt, and a half-apron that just protected the front. These half-aprons were less useful to the soldiers fighting in France and Belgium, and so men from the Seaforth Highlanders decided to turn them into art. Soldiers began signing the kilt aprons and getting their buddies to as well. Soon this practice evolved to the point where someone would draw the Seaforths' cap badge or illustrate a soldier along the top, and entire platoons and companies would then have each man sign their platoon apron. Some would include wry remarks ("Look out Kaiser, here we come!). 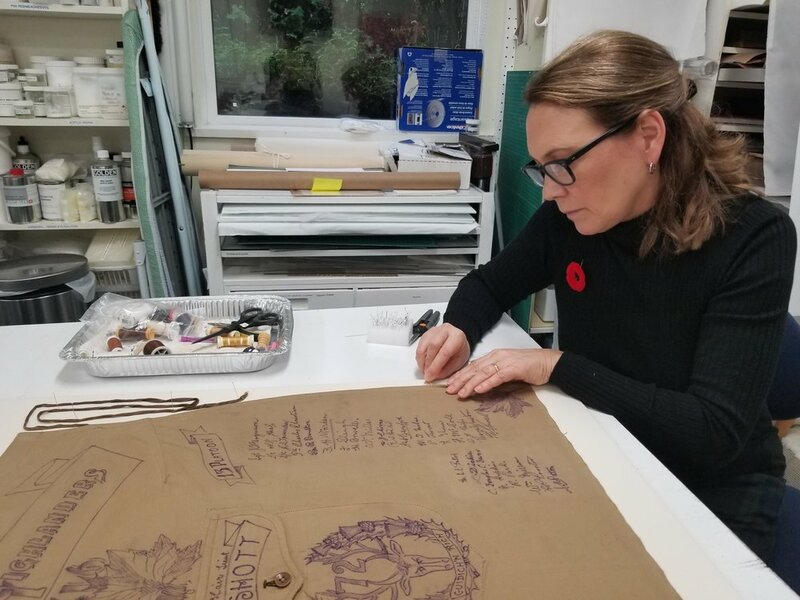 We believe that this tradition of signing kilt aprons before serving overseas is unique to the Seaforth Highlanders of Canada, having consulted with other Highland units across the country and in the United Kingdom. It is a tradition that continues to this day, with Seaforths signing aprons before going on operations, be it Operation Lentus to fight forest fires & flooding, Operation Reassurance in Eastern Europe, or the war in Afghanistan. After spending more than a hundred years hidden away in boxes in the museum, the kilt aprons were sent to Fraser Spafford Ricci for professional conservation. Having previously restored the 72nd Battalion Vimy Memorial Cross that is displayed on the parade square, we were certain the highest possible conservation standards would be met. Each apron took approximately six hours of hand stitching to secure it to an archival-grade backing, while the cleaning and treatment procedures required a level of precision beyond the museum's expertise. One hundred years after these Seaforths signed their names to these aprons, we've ensured they will last for another hundred years. We're thrilled with the result, and invite the public in to see the display on Remembrance Day, which marks the centenary of the 1918 Armistice. Three ‘walking wounded’ members of the 72nd Battalion, Seaforth Highlanders of Canada, in October 1918, east of Arras. The two chaps on the right are wearing full kilt aprons.